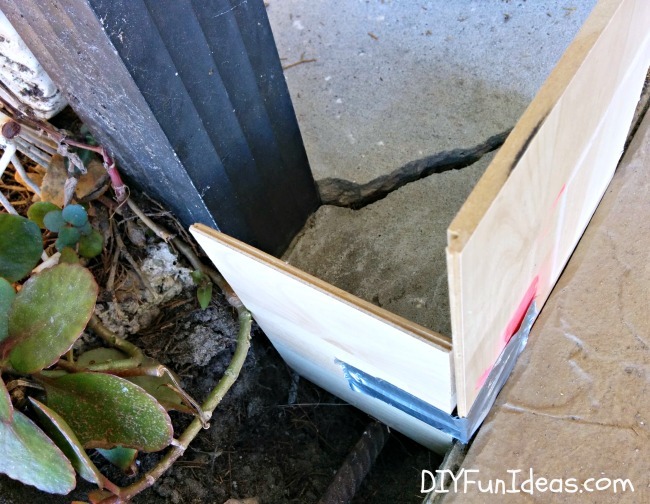 There was this crack in the concrete walkway at Mom and Pop’s house that was driving me nuts, so I repaired it and thought I’d share all the super simple fix-it details with you. At which point the crack, in the walk way on the left, stuck out like a sore thumb. It was very rudely screaming at me: FIX ME! And since I don’t like being yelled at, I did. 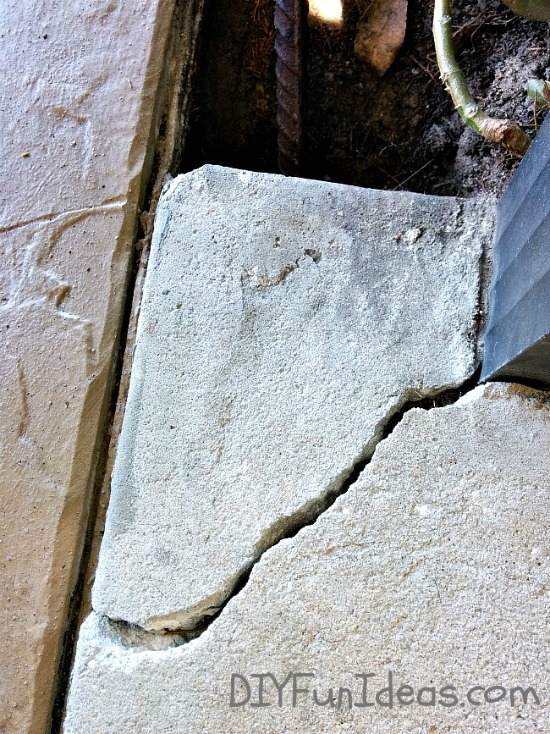 You can see how the cracked corner sits lower than the rest of the concrete slab. So my plan was to dig up the cracked end and place a layer of sand underneath it so that it sat level with the rest of the slab. But the darn thing wasn’t having any part of that. As I dug out the soil on the end, I found that the piece was not only six inches thick, but it was still completely attached to the post on the right. 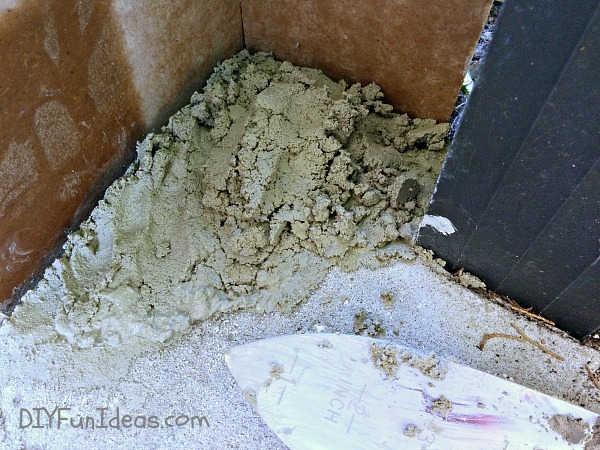 So I put my thinking cap on and came up with plan B: fill the crack with mortar mix and then use the mix to level out the top. And, I’m happy to say that it turned out perfect. I used Rapid Set® Mortar Mix for the repair. 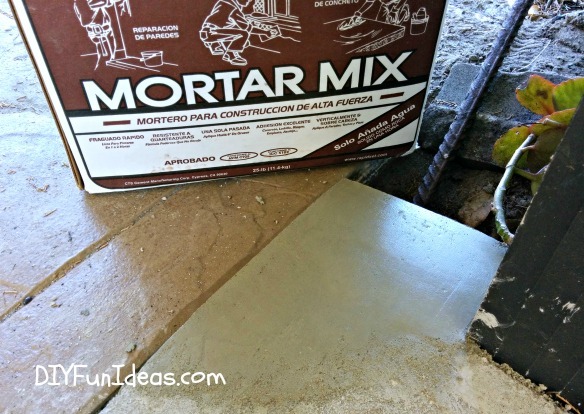 So why mortar versus concrete? The big difference between the two is that mortar is primarily used as a bonding agent. In this case, to bond the two broken pieces together. Concrete, on the other hand, is generally used for structural applications to form something. Thus, mortar was the way to go for this project. 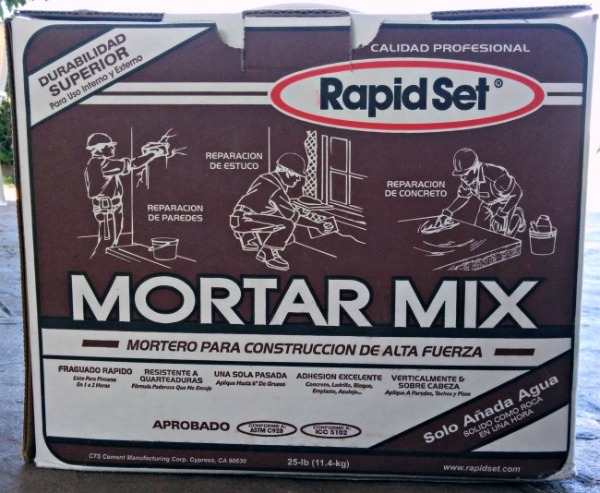 Also, Rapid Set® Mortar Mix, which is made of a blend of hydraulic cement and quality aggregates is super strong, super fast setting and will not shrink. So, what that means is: mix, apply, done, no worries. 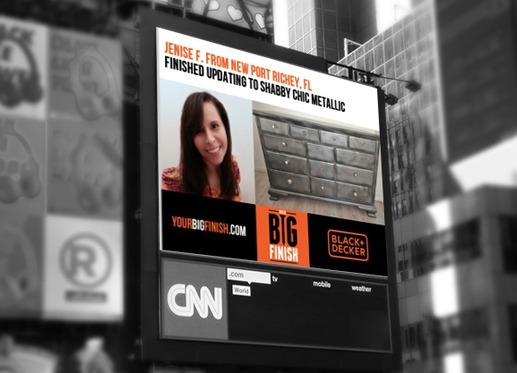 Oh, and did I tell you that you can find it at Home Depots across the U.S. and Canada! 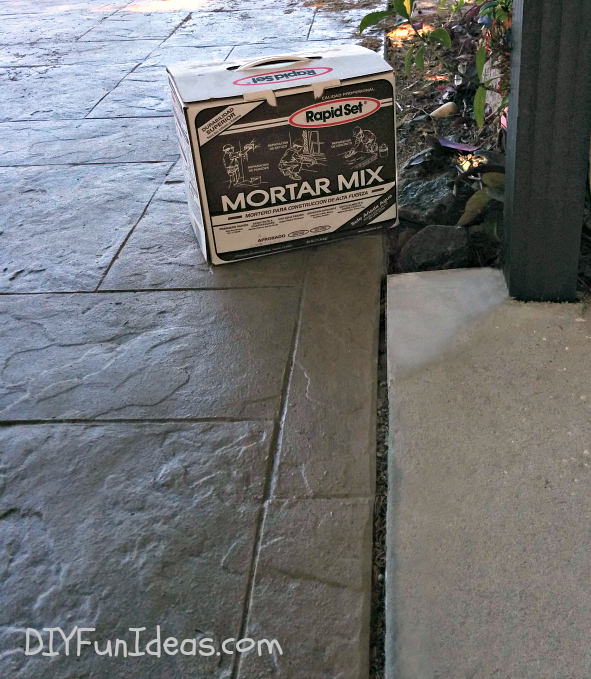 Now, once you’ve picked up your Rapid Set® Mortar Mix, you’ll need to prepare your surface for application. 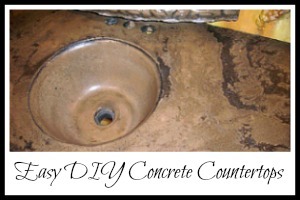 First, remove any loose concrete. 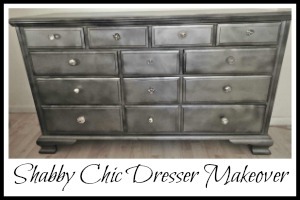 I used a hammer and chisel to chip off any loose edges, then used a stiff bristled brush to brush away any excess. Next, I used my chisel to create a small under-cut below the lip of each side of the crack. 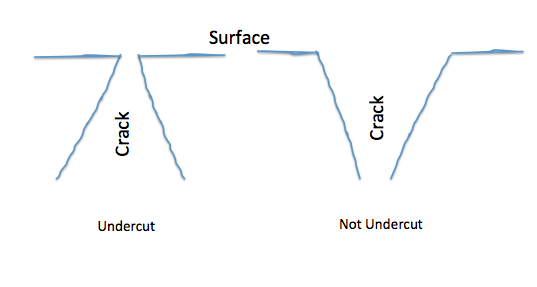 Basically, your crack should look more like the image on the left above. The difference is that in the years down the road, the undercut will help prevent slippage of the repair. Next, make sure your surface is thoroughly clean of any oils, dust, or debris. Since my plan A (to lift the corner) was a no go and I decided to level the cracked corner from the top, I needed to create a frame so that my mix would have a straight edge. 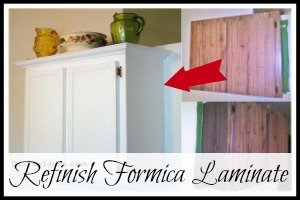 I had some scrap pieces of laminate boards hanging around from when I installed laminate flooring. So I used those along the edges. I just held the pieces in place with a strip of duct tape. If you’re working on a larger area that requires more structural strength, I recommend using a heavier material like wood and screwing the pieces together. Lily stopped by to supervise. Can’t get anything past that girl! 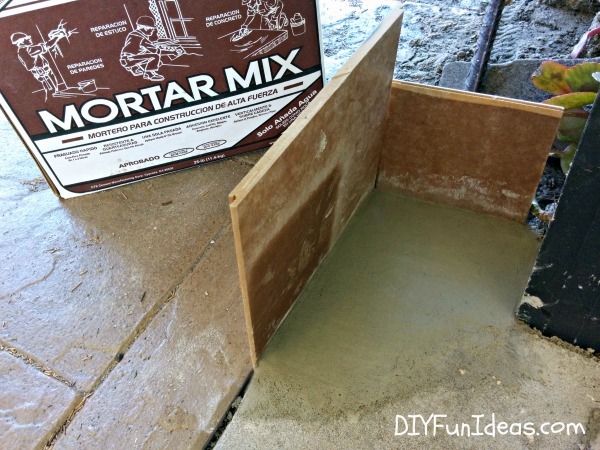 The next step is to mix up your Rapid Set® Mortar Mix at a ratio of 1 part water to 4 parts mix. 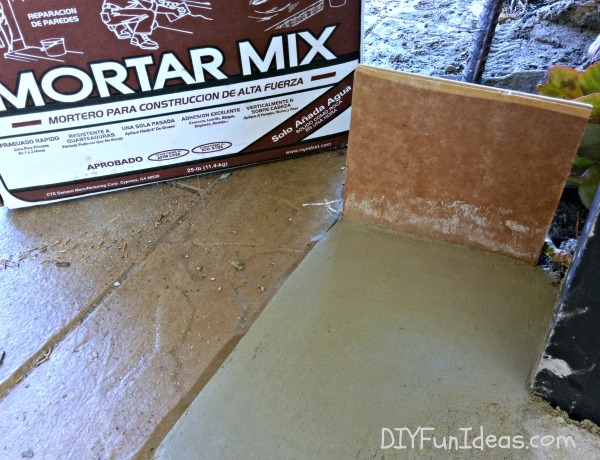 For my small repair, I used about 4 ounces of water and 16 ounces of mortar mix. 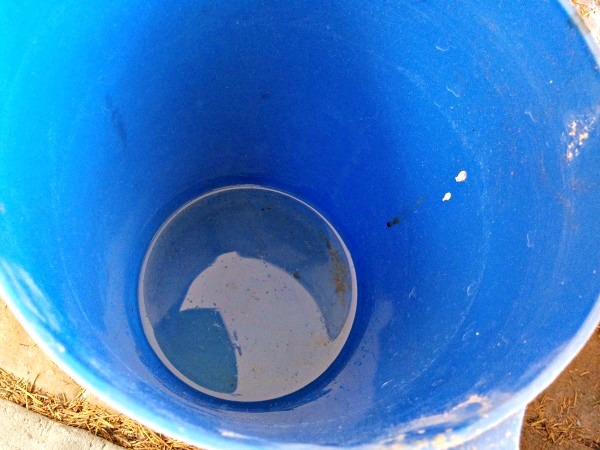 Pour your water into your bucket first. 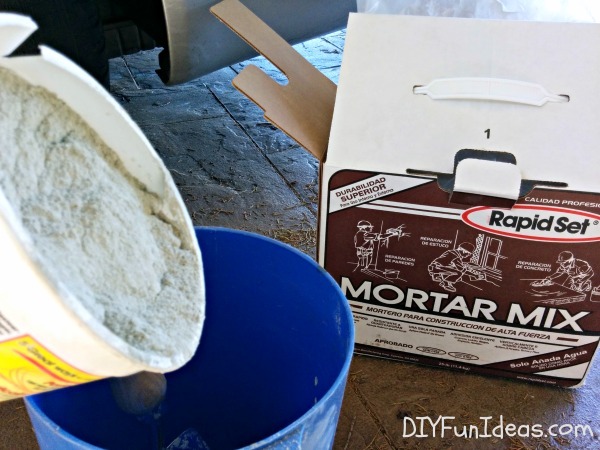 Then add the Rapid Set® Mortar Mix, mixing as you go. I used a small garden trowel to mix it up. The mix will be pretty thick and you want to mix it pretty aggressively until it’s lump free. 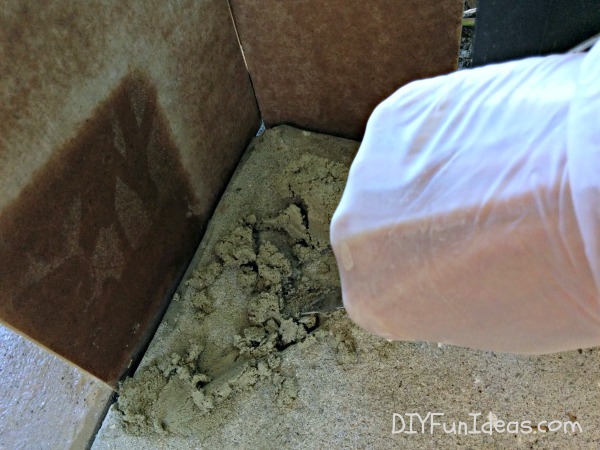 Before applying your mix, throughly moisten the area to be repaired. But make sure to remove any standing water. I simply poured some water over the area and let it run off. 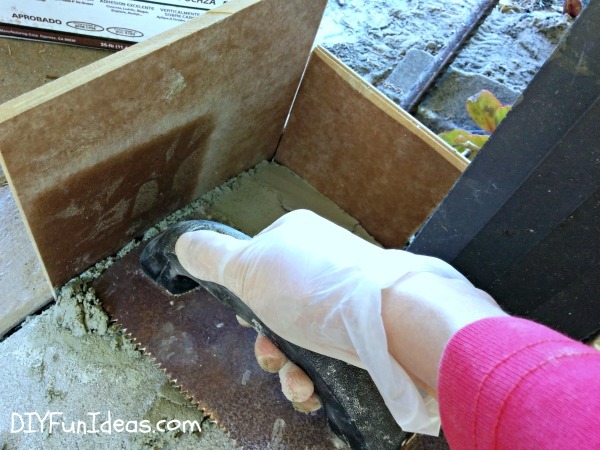 Once the repair area is thoroughly moistened, press the mixed mortar into the crack. I used both my fingers and a small mud knife to fill the crack. Then I poured the rest of my mix over the area I wanted leveled out. And used a trowel to flatten and smooth the surface. Next, keep your mortar moist for the next hour or so. I used a spray bottle to moisten. You can also cover the area with some plastic after it sets to keep the moisture in. After about an hour, when the repair was well set, I removed my edges. Even though the mortar was pretty well set at that point, I’d still recommend waiting a little longer than I did to remove any structural pieces… just in case. I suppose I’m a little impatient sometimes. So remember my before picture? The repaired section is a little brighter than the old concrete. But once it’s been exposed to the elements for a while, the difference will hardly be noticeable. There ya go! 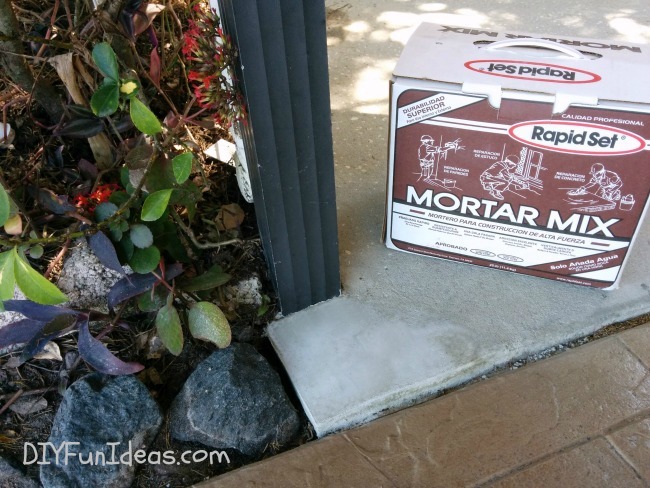 Super easy concrete crack repair with Rapid Set® Mortar Mix! Check out more fun Rapid Set® ideas on Pinterest! p.s. This post sponsored by CTS Cement. All opinions are my own. 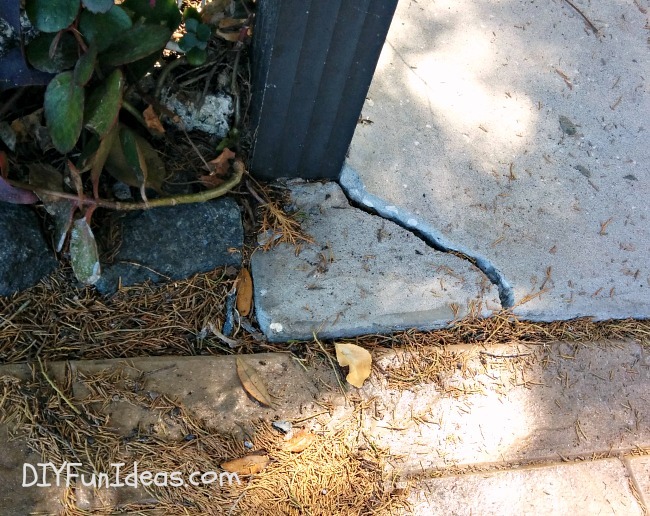 I’m so glad I found this post, I have a crack in the corner of my driveway too so I’ll definitely be using your tutorial and fixing that this spring! I’m so glad I could help Tania! It really is an easy fix and it makes such a difference in the appearance. 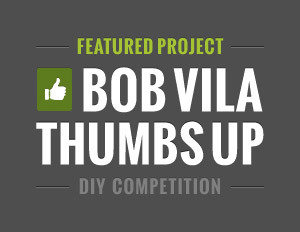 After you’ve fixed it, please do show off a pic on my Facebook page so everyone could see! What a great tutorial! Thanks for sharing with SYC. Good before and after pics,also the driveway looks great. Will get some mortar mix tomorrow and start fixin. Thanks so much Russ! It’s such an easy fix and will make such a difference. Please post some before and after pics on my Facebook. 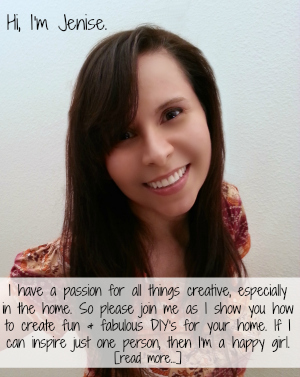 I’d love to see and share! Great tutorial thanks for posting. Oh, you are welcome! Thank you so much for stopping by!!! Any one have suggestions to fix asphalt cracks? 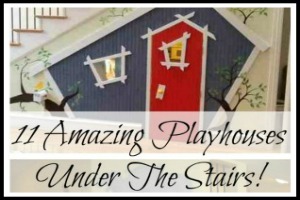 I just love this site! THANK YOU for all your wonderful ideas. As far as the asphalt goes, I haven’t done a repair on asphalt so I can’t speak from experience, but Black Top Repair should work. For small cracks use THIS and for large cracks use THIS. Hope that helps! This is really great, thanks for the tutorial! You’re so welcome April! Hope it comes in handy for you! Excellent I have a few pieces that need repair. Also I need to build a patio and would love to know if you a tutorial of how you did your folk’s patio coz it’s gorgeous. Thank you so much Kathy! That’s so nice of you to say. 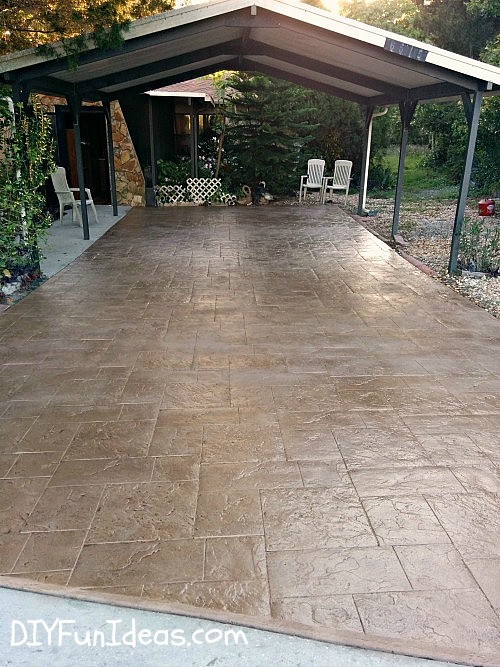 The tutorial of the stamped concrete will be coming out soon. Sorry for the delay. I’ve been waiting for the developers of the product to launch their website and that should happen in the next few weeks so please stay tuned! 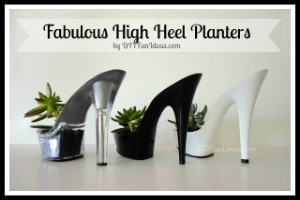 Love this tutorial! 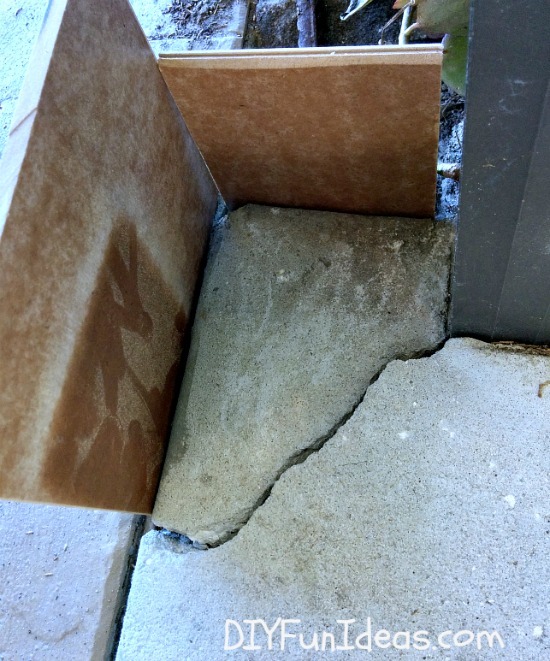 I have a crack that runs the width of my front porch(rrrrrrr)and it is right in the middle. Would this technique work without being able to use a frame? Yes, absolutely it will work without the frame. I only used the frame to create a straight edge because I was taking the mortar all the way to the edge to create a level surface. But if your crack runs right through the middle of your porch, it doesn’t sound like you’ll need that edge. Good luck with the fix. Let me know if you have any more questions. And please share a picture on my Facebook when it’s done. I’d love to see! Thank you so much Sherry. That’s so nice of you to say! I’m seriously considering using this to resurface my front porch! You did a great job repairing this crack! It is especially helpful to see your entire process here and see how you were able to do it all. 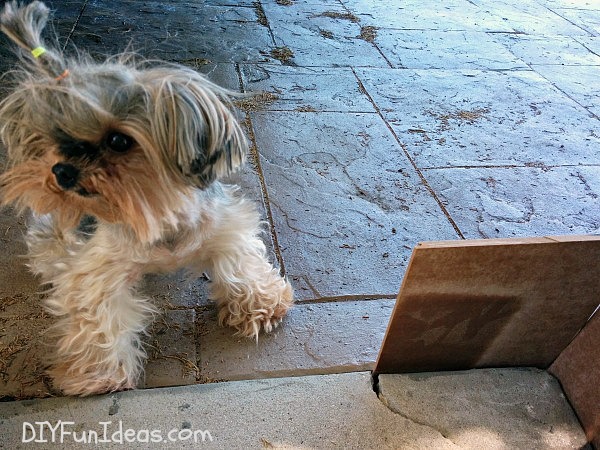 My patio has a fairly large crack through it, so I would like to try this out. However, the crack in my cement is more towards the middle and it is bigger, so I am worried it will be incredibly noticeable when I repair it. What are your thoughts on this? Is there a way to make it fit in with the rest of the concrete better? 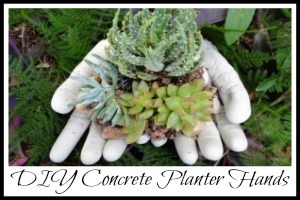 It’s hard to say without knowing exactly what the rest of the concrete looks like. But some thoughts are 1) if the color will be off you can add color to your mix (you can find color pigments HERE). 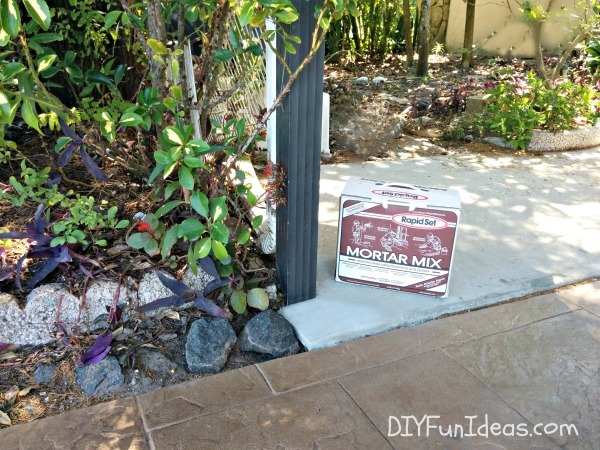 If you add color, I recommend mixing up a small amount of mortar and pigment first, making note of the ratio of the mix, and let it dry so you can see if you’ve got a good matching color. (You may need to mix up a few samples to get the perfect color.) Note that a little pigment goes a very long way. 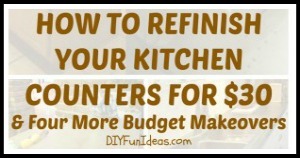 You may only need to add a tiny bit. 2) If texture is an issue, there’s a technique called brooming in which you just sweep the bristles of a broom over the wet concrete to give it texture. Another idea, but more costly, is to do something like THIS. 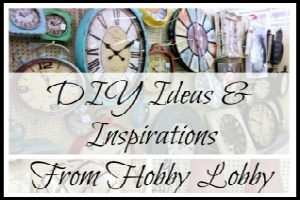 Hope those ideas help! I had a replacement bulkhead set on cement blocks. There are gaps between the blocks & the bottom of the bulkhead, letting in cold air & critters. I’m going to try Rapid Set here. Hope it works. Thanx for your help & ideas. Glad I could help. 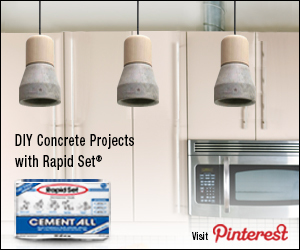 Plus, did you know that Rapid Set is made with hydraulic cement so it is specifically useful for projects that encounter a lot of water. It was so nice of your to repair the concrete for your parents! I didn’t realize that undercutting the crack before adding the concrete would make such a difference. This seems simple for a small repair like the one you did, but I have damage a throughout my driveway. At this point, it would be a lot easier to just call a professional. Wow! Good job! I will definitely try this one. I am using different brand from the past, but after seeing this post I really wanted to try this with my client tomorrow. Glad that I found your blog page. Thank you for sharing. This is a big help indeed! Over the years our driveway has acquired quite a few cracks. I would really like to re-pave the entire thing, but a solution like yours might be the best option for us. I really appreciate your suggestion to create an undercut in the crack to ensure that your repair is long lasting. Would you use this same technique to repair / replace concrete and end of driveway where it has broken away? Would you create a ‘rolled edge’ to the lip where it meets the street to make a smoother transition? so i tried the concrete countertop with rapid set cement all and woke up to find it had cracked all over the top! Im in shock what shoud I do? I was going to seal it today but now Im in tears, I didn’t have a plan b.
Oh no! I have no idea why it cracked. I wonder if you might have added too much water which would cause the concrete to ne weaker. 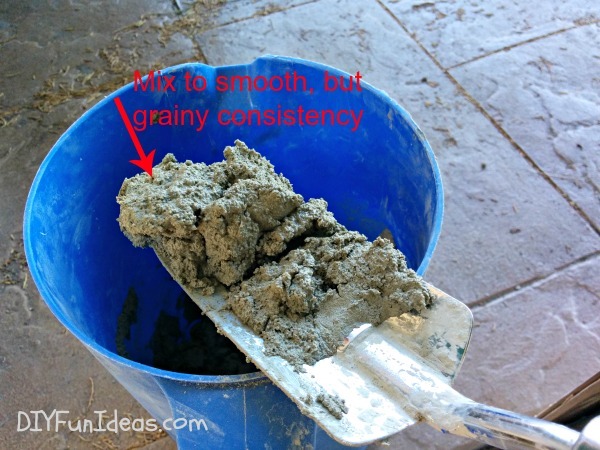 Is it possible to break off the cracked concrete and re-try with a thicker mix?